A photograph of Dickinson Jeweler and Gaines & Lee Furniture businesses in the Erisman Building on Main Street in Garden City, Kansas. 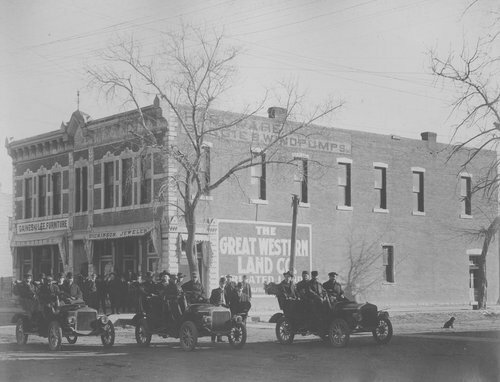 Several men are seated in three automobiles parked in front of the Erisman Building and others are standing on the sidewalk. Painted on the wall of the building is a sign for the Great Western Land Company.